This Ball Stainless Steel Water Bath Canner is designed to last for generations and serve a variety of purposes. 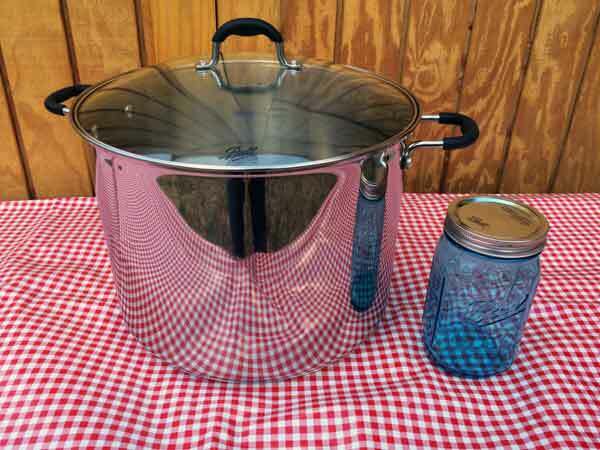 It can be used for canning or preparing large-batch recipes like soups or stews. It's sleek finish matches any kitchen decor scheme, and its 18/10 stainless steel construction provides durability. It features a high domed vapor seal cover with a handle and two silicone-covered side handles to ensure safe, easy handling. It's tempered glass lid includes steam vents to make viewing boiling water easy, and its 21-Quart capacity can accommodate up to seven quart-size jars. Finally, a triple-layered base of thick aluminum between stainless steel provides for even, efficient heat distribution. We also offer a kit that includes this canner, a 7-Function Canning Kit, and the Ball Blue Book! Note: This canner includes a chrome-plated canning rack that prevents small jars from falling through. Note: This canner can be used on all types of stove tops.